Confronting our own mortality is an emotionally fraught process few among us would willingly embrace. It demands honesty in the face of fear and acceptance at our loss of control. Artists in particular, if they so choose, face the added complexity of summarizing this tidal wave of emotions into visual form. If you knew your next gallery show was your last, what would you display? For Paula Ballo Dailey, the answer was simple—turn your pains, hopes and daydreams into intricate visual narratives that give voice to your core values and personal aspirations. Read this excellent review by Eric Hope here. 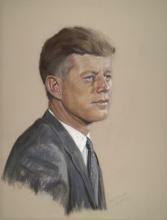 Today the National Portrait Gallery will install a pastel portrait of President John F. Kennedy by Shirley Seltzer Cooper in honor of the centennial celebration of his birth. The Portrait Gallery joins the nationwide celebration of the life and legacy of President Kennedy on the centennial of his birth, illuminating his contributions, policies and challenges he feared in the wake of the civil rights era and present. Kennedy’s portrait will be on view from May 19 through July 9 in the museum’s “Celebrate” space in the first-floor north gallery.